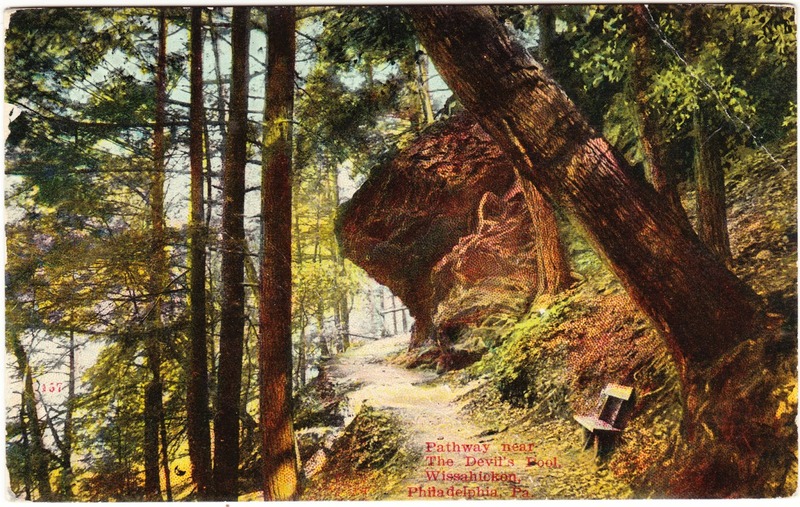 This postcard, from the first decade of the 20th century, has the caption: "Pathway near the Devil's Pool. Wissahickon, Philadelphia, Pa."
"Alex Bartlett, an archivist at the Chestnut Hill Historical Society, says no one knows exactly where the name 'Devil's Pool' comes from. But he's pretty sure it stems from an old legend, a sort of urban myth, that the Native American Lenape tribe considered the pool an interface between good and evil. "The site is maintained by Friends of the Wissahickon, a 1,600-member non-profit preservation organization. FOW executive director Maura McCarthy says Devil's Pool is the most trafficked area in the Wissahickon Valley Park. The organization last tallied visitors in 2012, counting 400 people in about a 10-hour time span — and only those trekking from Valley Green Inn, one of the two entrances (the pool can also be accessed from Livezey Lane). Devil’s Pool sits at the intersection of three Philadelphia neighborhoods — Chestnut Hill, Mount Airy and Roxborough — but it also attracts people from hours away, McCarthy says." Ideal Friend:— Please ex. cards with Ideal 12709 and Oblige J.E. Turner [?] Box 2905 Phila. Pa. Please ans soon. Yours for a Merry Xmas. "Adding to demand was public's growing interest in collecting cards, not just using them for correspondence. ... While many other collecting manias visited this time, it was the postcard album that families kept in their parlor, where it became the centerpiece of social gatherings. The production of most other types of paper collectables dating from older traditions faded away as it was replaced by this new desire. Postcard exchange clubs arose like The Jolly Jokers, which had more than 2300 members; The Society for the Promulgation of Post Cards with 5,000 members; and the Post Card Union with an astounding 10,000 members. Those who couldn't fathom the changing times often referred to these clubs as cults. Soon card dealers began to outnumber booksellers."